This is a rather attractive place. After finally finding a good mooring above Blackpit Lock and getting something to eat I went for an evening walk. It was starting to get quite dark and yet the camera lens seemed to cope with the conditions actually making things brighter than they were. 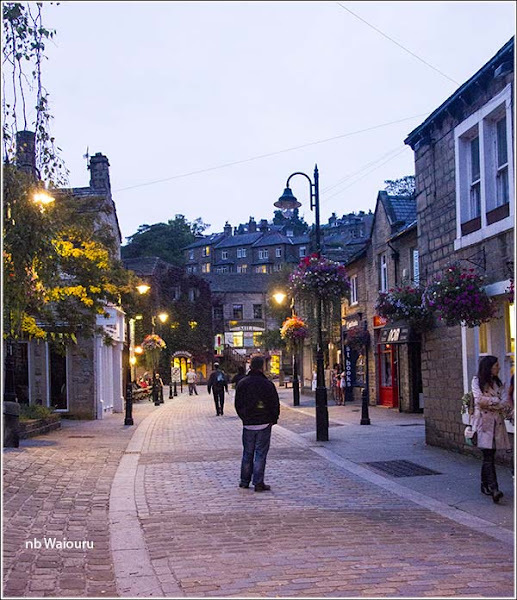 The centre of the town has a pedestrian precinct where the pubs and cafes looked well patronized. I wandered further up the hill on the northern side of the town for a final photo before returning to the boat. This morning we wandered back into the town stopping at the open market to buy some bacon and a medium sized steak pie which we will have for dinner tomorrow. Lunch was at one of the local pubs where Jan declared she had eaten the best roast beef since her return to the UK. Back at Waiouru I plotted a circular walk which was uploaded to the gps. 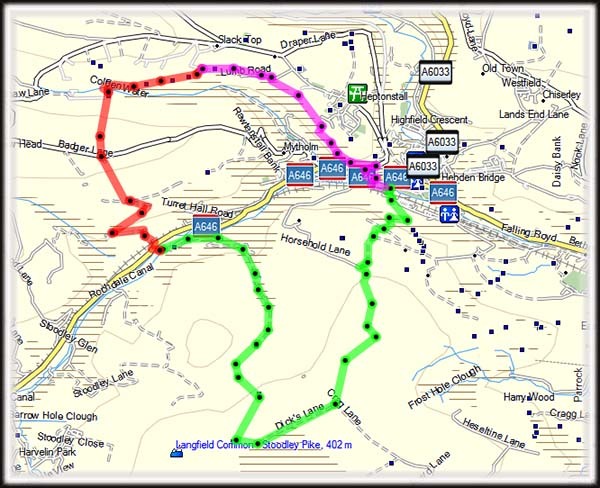 The route would encompass two hill climbs and I was hoping for a good workout. Fifteen months ago I’d have flown up these hills but today the fat old body huffed and puffed its way to the top. 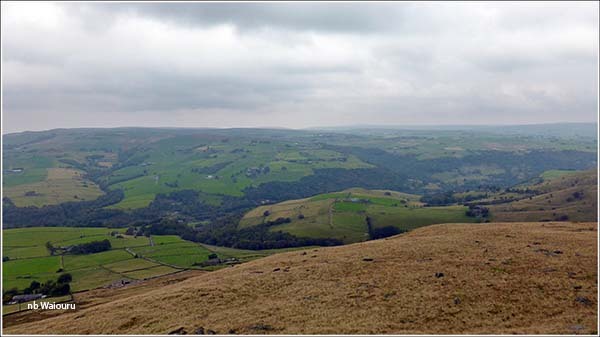 On a more positive note there were good panoramic views of the southern Yorkshire Dales. Looking down into Hebden Bridge. Once on top it was possible to see a distant monument. I hadn’t planned to walk there but was intrigued by its size and location. It’s shown as Stoodley Pike on the map. 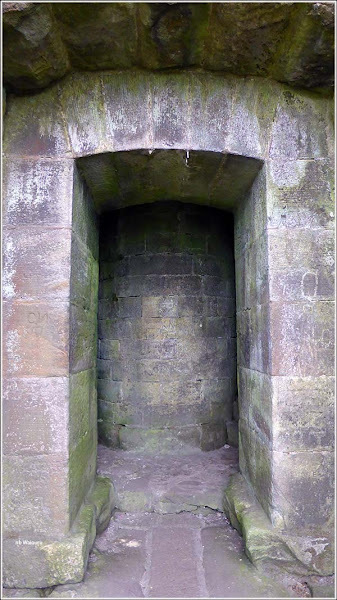 At the base on each side was a blind alcove. Well that’s what I thought until I discovered one alcove was actually an entrance to a spiral stone staircase which gave access to a viewing platform some 40ft higher. Central core of the spiral staircase in the middle of the photo. There was no lighting which meant I had to be particularly careful using the stairs in total darkness. there were good views of the countryside from the viewing platform. 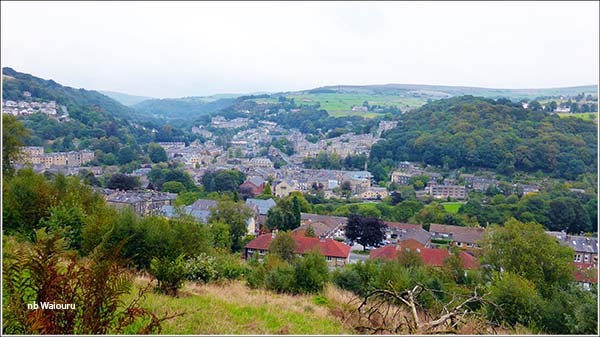 This is one of the most popular walks in Calderdale. 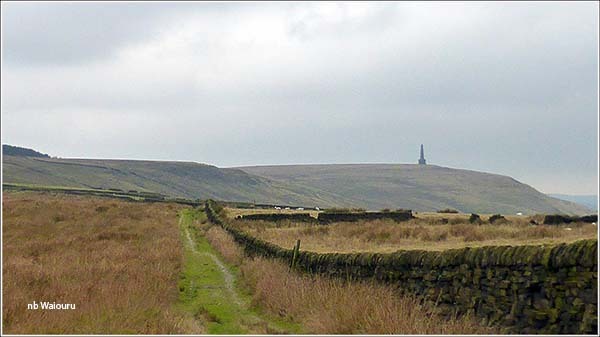 The reason for its renown is the Stoodley Pike Monument. 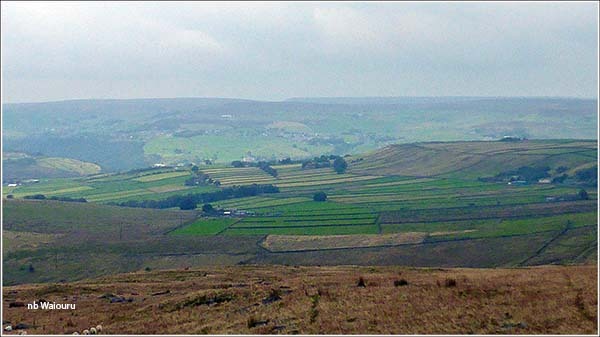 The monument can be seen for miles in the Upper Calderdale area. It stands 100 feet tall, which is much higher than most hillside monuments. I can't think of one in Yorkshire which comes close. The existing monument is the second to be erected as the first one fell to the ground in 1854, forty years after it was built to commemorate the defeat of Napoleon's armies at the Battle of Leipzig. 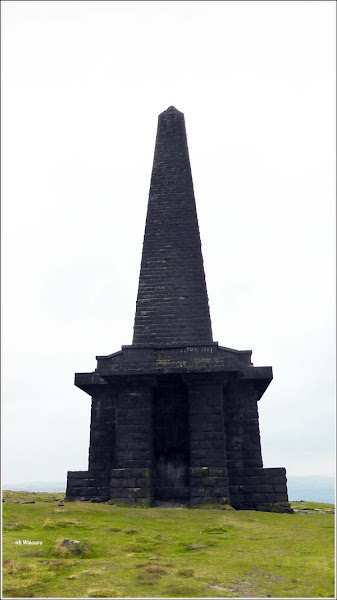 The people of Calderdale must have been pleased about Napoleon's reversal for the first monument was paid for entirely by public subscription. The monument stands tall and proud today, a tribute to the people of this historic valley. 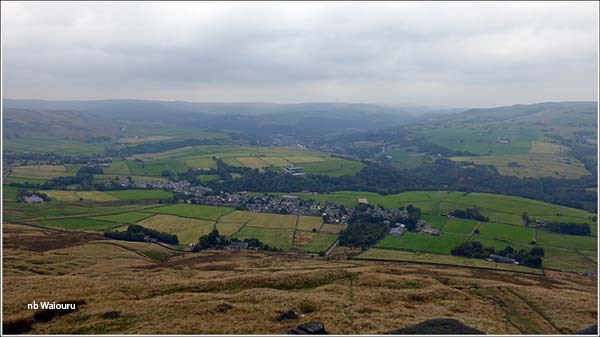 The walk takes us up to the monument on Stoodley Pike from Hebden Bridge. 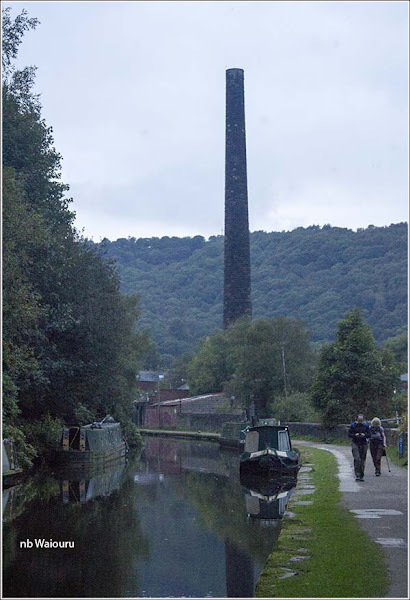 After climbing from the valley floor along tracks, through fields and over moor the return is made by much the same way except for the final three miles which is enjoyed along the towpath of the Rochdale Canal. 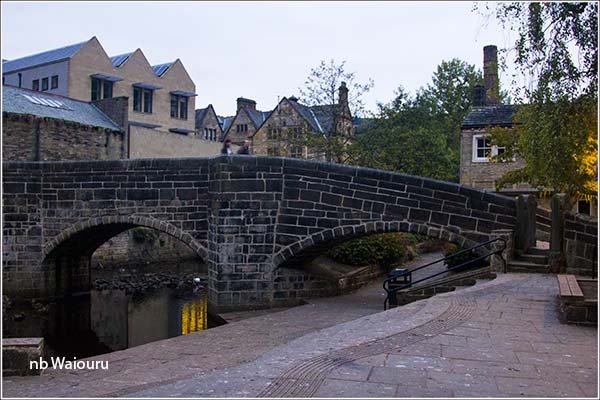 Jan had been reading about Hebden Bridge and told me the town has the highest percentage of lesbians per head of population in the UK. Also, one should be able to smell the electric tobacco when walking around. I think someone is making a mountain from a molehill as we neither smelt nor saw signs of either. What did stand out were the number of tall brick chimneys and buildings that look to be former mills. It appears logical that mills would be located in the area. The valleys are reasonably narrow and there are numerous streams feeding the River Calder. This would have provided power for the mills whilst the canal provided the transport. It was wool rather than cotton. 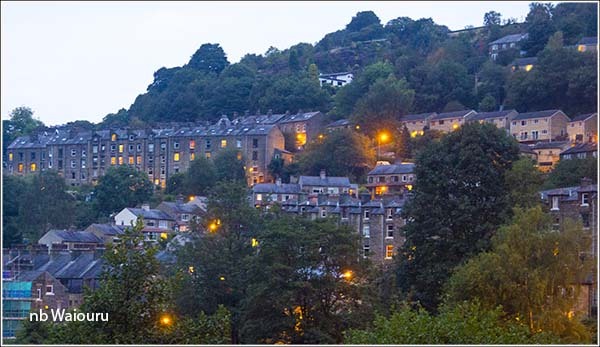 Wikipedia states “at one time Hebden was known as "Trouser Town" because of the large amount of clothing manufacturing”. The town is also known for its "upstairs-downstairs" houses known as over and under dwellings. These were houses built in terraces with 4–5 storeys. The upper storeys face uphill while the lower ones face downhill with their back wall against the hillside. The bottom 2 storeys would be one house while the upper 2–3 storeys would be another. This also led to unusual legal arrangements such as the "flying freehold", where the shared floor/ceiling is wholly owned by the underdwelling. He's one or two steps ahead of you, but reports today that he's stuck just below the summit as there isn't enough water. There is a time delay with the blog posts. When you read Thursday's report you will understand why Tug Harry is stuck! I'm up to speed with Firefly NZ - Ray & Leonie's blog poor ole Halfie is way behind! I did wonder why your posting a day behind? where you actually are. Still enjoying the read, been a daily must do for some time now. We're running behind with the blog posts because I'd wanted to have a couple of posts up my sleeve when back tracking from Ripon. I'm still attempting to catch up!